It is called Ngebel Lake because it is in Ngebel subdistrict territory. It is located about 24 km to the north-east of Ponogoro, Ngebel lake is in the slope of Wilis mountain with 734 metre height on the sea and the temperature 22 to 32 celsius. With the wide of surface about 1.5 km, Ngebel lake surrounded by the road along 5 km. This lake has an amazing panorama, cool air with the maiden nature condition that kept one million potentials to be dug up. We also could met various fruits like: durian, mangosteens, pundung, etc. In the lake also spread various fishes, one them is the variety fishes that has protected. It is Hampala fish or the local inhabitants named Ngongok fish. For that purposes, it also available accommodation facilities that already for the visitor who want to spend the night. The facilities is managed by the Regional Government and private enterprise. 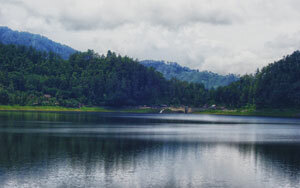 According to the developing legend in the community, Ngebel lake was formed based on the story of a dragon snake, named “Baru Klinting”. When the snake take a meditating and unintentionally he was cut-piece by the community around to be eaten. Mysteriously the snake changed into a child who afterwards visited the community and made a contest to repeal the rib that was transfixed by him into the land. Not even one succeeded in carrying it out. Afterwards he repealed this rib, and from this rib hole went out water that afterwards became the big pool that welled up and became Ngebel lake. It seems Ngebel lake had important role in the history of Ponorogo Regency, because one of the founders of Ponorogo regency, Batoro Katong, before doing the greatness Islam religion in Ponogoro regency had clear himself in a pool near to Ngebel lake. At this time, it is known as pool / Kucur Batoro.